Although all Fords looked nearly identical during the 1949-1951 model years the cars themselves were dramatically changed underneath. The reason was that the '49 was a dog of a machine that rode poorly, rattled and shook, and was fraught with defects. During its 17-month production run it caused nothing but trouble for the company, but well over a million of them were sold to a public starved for new cars. By the 1950 model year's fall of '49 introduction, Ford engineers had solved most of the major problems with the cars. The loosy-goosey '49's frame and body were stiffened and thickened in many areas, body sealer was pumped into weld joints, door weatherstrip was redesigned and the front end was re-engineered. The old one, Ford's first fully independent front suspension, was impossible to align so the '50 model was given the addition of a redesigned torsional stabilizer and a bunch of other tweaks. The rear springs were relocated as well in a response to customer complaints about bouncy ride. The gas filler neck was removed from the body and put behind a little flap door and the bumpers were strengthened to allow the cars to be jacked up. Many earlier '49 Fords were attempted to be jacked up at the side of the road, only to find the bumpers and brackets bending hopelessly out of place and the wheel still on the ground. Many other refinements were put into the 1950 models in an attempt to keep customers from going over to Chevrolet and, for the most part, the result was quite acceptable. The base engine was the same flathead inline 6 from earlier years. It was a very good engine that put out 95 horsepower. The venerable flathead V8 was optional. It put out 100 horsepower and didn't suffer the piston-slap and timing gear problems of earlier engines. Sedans and business coupes were upholstered in striped gray fabric or broadcloth, but customers could opt to get the same thing in tan. Vinyl was used on the sides and tops of seats and the door panels were done in the same material as the seats. Headliners too were done in broadcloth and the stamped-steel instrument panels were done in either gray or tan. These were the days of rubber floor mats, by the way, and only the very top-end models offered carpet. "Magic-Air" heaters were optional too. The 1950 model lineup included 2-door and four-door sedans, business coupes, convertibles and station wagons. The top of the line was the Crestliner, a gussied-up and heavily trimmed model that very few people bought because Ford didn't advertise it in any noticeable way, and it was about $200 more expensive than the other models. That was a lot of money in 1950. 1950 Fords were basic cars. Transmission offerings were limited to the 3-speed manual (three on the tree!) with an optional overdrive that was touted as "automatic," in the sense that it would cut in at speeds above 27 mph and return to normal below about 20 mph. Tires were 6.00 X 16, which was typical of the day. Whitewalls were a big deal back then, but tire life was pitiful by today's standards. Ten-thousand miles was a long, long life for a tire. 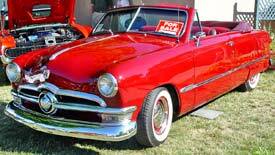 1950 Fords are actually quite popular with collectors. Convertibles and wagons (wagons?) are the most sought-after, with fully restored examples routinely selling in the $30,000+ range. Crestliners are virtually non-existent and very valuable. 1949 Fords, by contrast, are not popular with knowledgeable collectors for all the reasons above. Besides, most of them were junked long, long ago and a good-condition '49 is a rare thing to find.